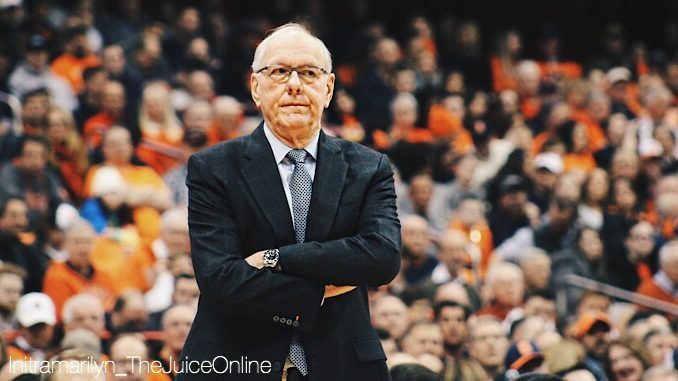 Syracuse coach Jim Boeheim looks on from the sidelines. Mandatory Photo Credit: Initra Marilyn, The Juice Online. WHAT HAPPENED: After Paschal Chukwu’s tough catch and shoot layup pulled Syracuse to within 70-67 with 3:24 to go, Baylor guard Makai Mason rebounded his own miss and hit a jumper to put the Bears back up five. The teams traded turnovers, but Tyus Battle fouled Mason with 1:07 left and Mason hit a pair of free throws to put Baylor up 74-67. Syracuse completely fell asleep on the press with 48 seconds left, as Freddie Gillespie beat the defense down the floor for an uncontested dunk, and the Orange was eliminated from the 2019 NCAA Tournament. Baylor set a school record for made 3-pointers in an NCAA game, hitting 16. ANALYSIS: It’s hard to say that this was anything but a disappointing season. With the exception of Matt Moyer, Syracuse returned its entire team from last year’s improbable Sweet 16 run and was ranked in the top 15 coming out of the preseason. But SU’s offense never found its identity, and Thursday night was a microcosm, as the Orange scored just two points in the final three minutes of the game. Part of SU’s offensive struggle came from an injury to Syracuse’s starting point guard, Frank Howard, prior to the season. He never regained the form from his junior season, and his career ended unceremoniously in a suspension for a violation of team rules. As a result, the Orange was ranked 63rd in the NCAA in adjusted offensive efficiency according to KenPom. HERO: Mason, battling a toe injury, scored 16 points in the first half and added four late points to push Baylor to the finish line. Gillespie came off the bench for eight points and five rebounds to go with two blocks. Elijah Hughes led Syracuse with 25 points, though most of his damage came in the first half when he scored 18. ZERO: Buddy Boeheim may end up leaving Syracuse as one of the greatest shooters in school history. But in his first taste of NCAA action, he went 0-6 from the field and 0-4 from downtown for just two points, replacing the suspended Howard in the lineup. WHAT’S NEXT: A long offseason with plenty of questions. Will Battle return for his senior year? Will any of Syracuse’s underclassmen transfer? Can the Orange add any late additions to its 2019 class? We’ll find out during the summer. For now, it’s lacrosse season in Central New York.